After a very long and hot beginning of November, it has finally cooled off enough to feel like fall has arrived! With the conclusion of Halloween, many of you are ready to kick off the holiday season – Christmas style. While you might hear the joyous sounds of the season coming from my car or house, we must first stop and give thanks. We all know that we should be thankful throughout the entire year, but it never hurts to have a little reminder. So start your thankful posting on Facebook and don’t forget we still have to celebrate that great holiday known as Thanksgiving. The fullness of grace that enriches our lives like nothing else can. Forgiveness that is freely given, even when it is not deserved. Unrelenting love that will do anything to win our hearts. Thank you Jesus! Without you, I am nothing. Another thing that I’m thankful for this year is the desire to keep sewing. 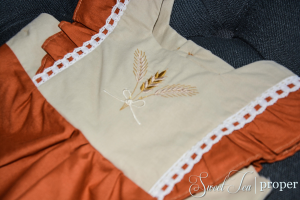 It took a long time to get over my fear of sewing or more commonly put, my fear of failure. Whenever you start a new hobby, sport, project, etc. that fear has a way of lingering well past it’s due date keeping you immobilized. As with most skills, if you take the time to practice and learn, you will improve and the fear will fade. I have yet to create an outfit that is perfectly sewn, but with each project it is getting easier. Last week we shared our Up, Up, and Away Hot Air Balloon Dress. It is one of my favorite designs to date and uses the same pattern that is used for this design. 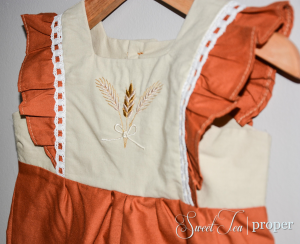 The Fall Harvest Jumper consists of a natural bodice with a beautiful wheat embroidery design. 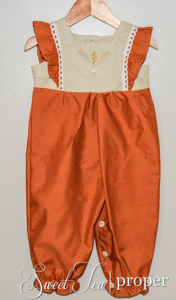 The ruffles and pants are a burnt orange which is perfect this time of year. To finish it off, we added an ivory cotton lace to the ruffles to really accentuate the bodice. The jumper was created using the Simplicity Pattern 1470A with some adjustments including the addition of buttons instead of a zipper and adding buttons to the legs and crotch area. If your little one is not potty trained yet, it is essential that you add buttons or snaps to the lower region for easy diaper changing. *This pattern and design can easily be altered into a dress if you prefer a skirt to the jumper pants. Follow the same instructions for the bodice and then continue with the pattern instructions for the skirt. 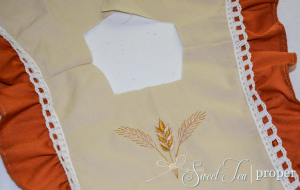 The beautiful wheat embroidery can be purchased here! The original purchase price is $2.25, but as of today, the cost is $.90! I thought I did well purchasing it at the original price! Bodice Front (1) – Cut 1 of fabric and 1 of lining (Kona Cotton in Khaki). Bodice Back (2) – Cut 1 of fabric and 1 of lining (Kona Cotton in Khaki). For center back, add 2″ before cutting. Then cut the fabric down the center so you have two sides. Ruffle (3) – Cut 2 ruffles (Kona Cotton in Orange Spice). Bodice Side Front (4) – Cut 2 of fabric and 2 of lining (Kona Cotton in Khaki). Bodice Side Back (5) – Cut 2 of fabric and 2 of lining (Kona Cotton in Khaki). 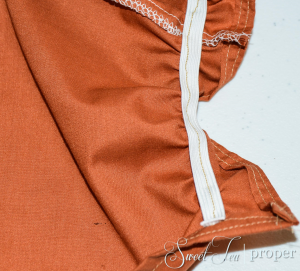 Pants Front (14) – Cut 2 of fabric (Kona Cotton in Orange Spice). Add 1 1/2″ to 2″ (depending on button/snap size) to inside leg and crotch area. Pants Back (15) – Cut 2 of fabric (Kona Cotton in Orange Spice). Add 1 1/2″ to 2″ to inside leg and crotch area. Lace – Cut lace from the bottom of the front bodice over the shoulder ruffle and down to the bottom of the back bodice AFTER the two bodice pieces (front and back) have been sewed together and the ruffle has been attached. Follow the pattern sewing directions for Dress A, B from steps 1 – 4. Lace – Open up the ruffle where you are viewing the bodice front and back right side up. Lay the lace flat on the ruffle and sew it to the edge of the bodice where the ruffle and bodice meet. Make sure to use a thread color that is similar to the color of the lace. Continue following the pattern directions for steps 5 – 12. This is what it should look like around the end of step 9 after sewing the lining onto the bodice. If you have a bit of excess like I did, you can trim that up before going on to the next step. 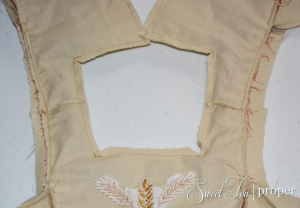 Once you turn everything right side out, your bodice is almost complete. Believe me, the hard part is over! This is a good time to give everything a good press with your hot iron. Bodice Back – At this point, go ahead and add your buttonholes. Make sure to keep in mind of the bottom bodice seam allowance when marking your spots. To make your markings, I usually start from the top and make a mark, then I mark where I want it on the bottom, and finally measure the center from the top and bottom marks for the third buttonhole. Pants Front– Fold under the bottom (ankle) portion of the pants leg 1/4″ and press. Fold under again and sew in place. If you are using snaps, you will need about four layers of fabric to add the snaps. Although you don’t necessarily need that for buttons, it is nice to have the extra thickness for durability. Press the inside leg seam and crotch area 1/2″. Press under again. If you added 2″, you can fold and sew under a third time to give you the four layers or sew now to give you three layers. With right sides together, sew the right side to the left side at the center crotch. 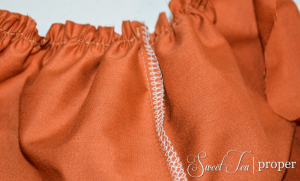 Finish seam by either serging or using the zigzag stitch. Trim seam. Add the gather to the top of the pants. Repeat the same steps for the pants back. 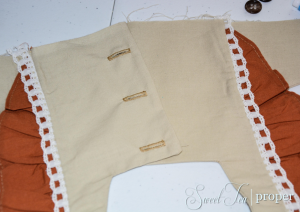 To attach the pants to the bodice, begin with the bodice front and pants front. 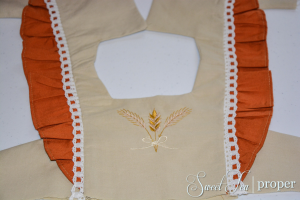 Place the pants right sides together with the bodice front where the legs are above the head portion. Adjust the gathers and sew in place. Finish the seam and trim. Do the same with the bodice back and pants back. With right sides together, sew the bodice and pants side seams. Finish the seam and trim the excess fabric. Now you can really see the jumper take shape! I am certain there is a correct way to do this next part, but I don’t know it so here is my way. Somehow I managed to lose the half of the instructions that said how to add the gather to the ankle portion so I looked at a jumper that I had on hand and made up my own instructions. Contrary to the crooked stitching line (which you can’t even tell from the outside), this method worked pretty well. Starting at one side, pin the top of the elastic to the end of that side and stitch in place. Go ahead and add a back stitch and another forward stitch to really secure it. While you are sewing (slowly! ), give the elastic some tension as you work your way to the end. Once you get to the end, back stitch and forward stitch to secure the end of the elastic and trim the excess. When you let go of the tension on the elastic, the ankle portion should naturally gather. Continue on the other side. Mark and add your buttonholes or snaps to the inner legs and crotch area. Sew on the buttons and you are done! We’d love to see your finished product! 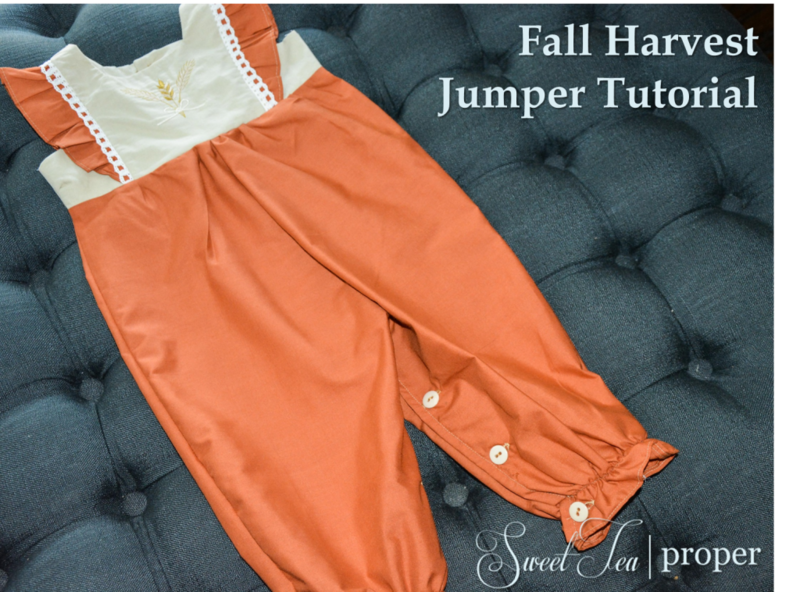 If you sewed the Fall Harvest Jumper or your own creation with this tutorial, please e-mail us your picture so we can showcase it on our DIY Gallery!